An unparalleled opportunity to own a remarkable architectural pedigree in a prestigious location with stunning views and a truly exceptional design. This timeless, contemporary home is incomparable with extraordinary attention to detail throughout that exceeds the expectations of modern luxury. Masterfully designed by PIQUE Architecture incorporating clean lines and warm materials and built by Timberline, using only the finest of materials and finishes, every element of this residence has been created with optimum livability for every member of the family. Located on a large, private 1 acre lot on Tetherow’s signature 17 hole, this light infused 4 bedroom, 3 full bath, 2 half bath, home boasts extraordinary indoor/outdoor living spaces with each room flowing seamlessly to the next. High end features include radiant heat flooring, floor to ceiling windows, wine cellar, four car garage with additional storage, and stunning Cascade mountain views from the master, two guest rooms as well as office. Perhaps the piece de resistance is the “Fun Room,” designed with both kids and adults in mind. Here you will find an interior climbing wall, home gym, a built in orchid and gardening room, full sized Bocce Ball Court and outside yard specifically designed for a regulation volleyball court. With no detail overlooked, guests will be transfixed by the spectacular water feature that greets them at the home’s entrance, Inside, the open and spacious floor plan is ideal for formal or casual entertaining, with a stunning chef’s kitchen complete with large center island, sleek countertops custom Italian Pedini Cabinetry and professional style stainless steel appliances. The nearby Great Room has a stackable sliding door that leads to one of the several perfectly designed outdoor spaces including a state of the art fire pit and seating area. The first floor master bedroom, with fireplace and ensuite, spa like bath, is gracious and privately sited and captures one of a kind mountain views. Upstairs, two additional bedrooms with built in cabinetry, is perfect for family and visitors. 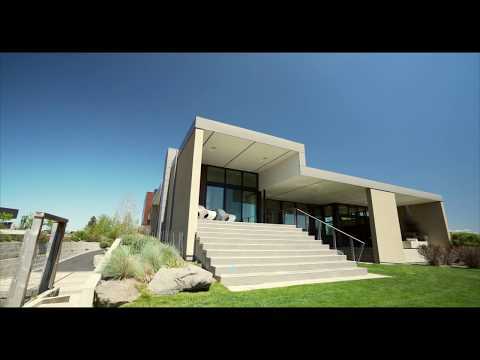 For the desirable Central Oregon lifestyle, this home has so much to offer and includes membership to the Tetherow Golf Club, featuring an 18 hole golf course, pool, restaurants, fitness facility and more. Downtown Bend is just minutes away for a wide variety of dining, shopping and entertainment options. I found this listing at 61462 Weinhard Court in Bend and would like more information. Thank you.